The information you need to set up a successful cause marketing initiative in your organization. Cause Marketing is a key area of opportunity for companies. It is a way to gain exposure to new consumers, strengthen brand trust and allegiance with current customers, and, most importantly, direct funds to a cause or organization that is working to make a positive impact in a targeted area. A challenge with this part of corporate responsibility is that there can be many definitions regarding what cause marketing is, and what departments should be involved in these efforts. Cause Marketing is when a company uses part of its marketing budget to bring greater awareness and donations to a specific nonprofit organization or cause. It is different from employee giving, fundraising, and grant programs. "The power of profit-and-purpose partnerships is too great to leave your choice of nonprofit partners to chance...Companies should seek out those nonprofit organizations that can provide expertise, transparency, community and business impact. Finding the right organizations that can help your company affect true social change is crucial to the health of your triple bottom line." 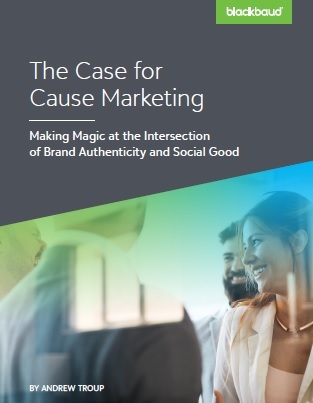 Explore the full eBook on "The Case for Cause Marketing" from Blackbaud and Catalist here. You'll learn additional players to have at the table for valuable input, as well as qualities successful cause marketing programs or campaigns share. Finally, understand next steps to get a cause marketing initiative off the ground in your organization!